I have definitely neglected my posts! I have been so busy with personal matters and a big commercial design project that I have had very little time to check on my favorite bloggers as well. Even though I may not be able to take time to comment I have been trying to keep up some of many of my favorite bloggers. 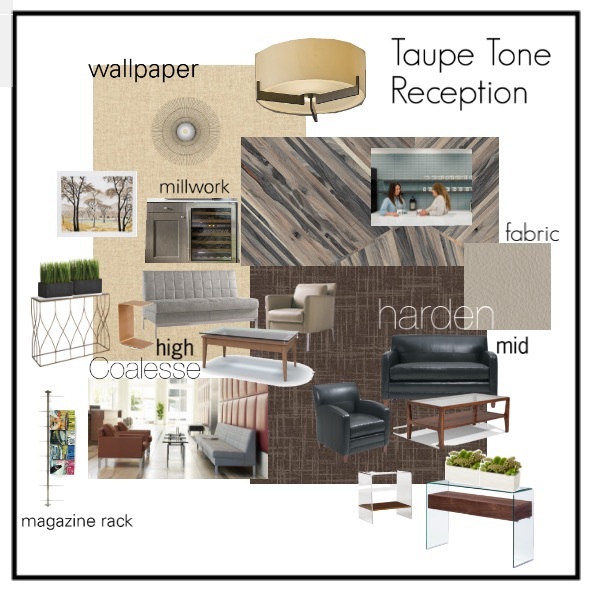 Here's a quick post of the chosen board for our Doctor's Concierge Office Design. I must add that a few things will be changed such as no console table and now a round coffee table will be added because of a change to the entry doorway. I for one cant wait to see the Artistic Kauri Tile installed and all the elements come together. I will keep you posted on the progress and I hope you all are having a wonderful Summer! ooohhhh....i can't wait either to see that tile! this is gonna look good! This looks fabulous! I cannot wait to see this is real life. Karolyn I love your board, neutral with a warmth in texture and mixed surfaces. This is going to look beautiful! I hope you can share some pictures when you are done! Enjoy the summer! Looks like a storm is heading this way as I type!